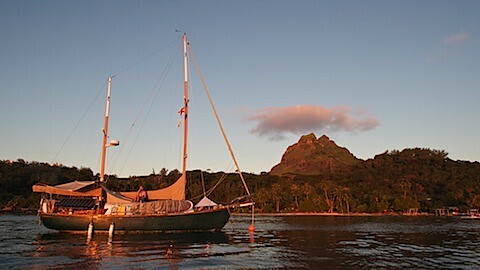 We left Raiatea on Monday the 25th and had a nice day sail to Bora Bora. It was a downwind sail and we went through the hassle of setting up our whisker pole to run wing on wing downwind and it ended up paying off. Two larger sailboats had left Raiatea about 15 minutes before us and we ended up getting to the pass in Bora Bora about 15 minutes before them. We're not racers but we do like it when we can beat boats that are supposed to be faster than us. We picked up a mooring ball at the Bora Bora Yacht Club. Don't worry, it's not as ritzy as it sounds. It's basically just a restaurant / bar with moorings and a dinghy dock. All the anchorages here are pretty deep. We could anchor but I generally pull our anchor up by hand (we have a manual windlass but it's awkward to use) and pulling up the anchor and chain from 60 feet is not fun and given the fairly low price of a mooring here, it seems totally worth it. So far, we've just been working on boat projects and hanging out with friends while we wait for good weather for the crossing to Rarotonga in the Cook Islands. There are some pretty big seas forecast through the weekend. It wouldn't be anything we couldn't handle but, after our very uncomfortable trip to Tahiti, we'd rather just wait a few extra days for smooth sailing rather than charge out into big puke inducing seas with 25 knot winds. For those of you who've been confused about where we are, I've updated the map. It now shows our trip as far as Raiatea. I may also try to add our projected path out to Tonga. I also updated the Calendar tab. The calendar now shows when we were in various places along the trip. Of course it'd probably be more useful to show where we're going to be in the future but that would require a level of clairvoyance that I've yet to attain. Glad you beat the big boats to Bora Bora. Can't donate but will the bronze eyebolts suffice? You can anchor in shallow water sand bottom somewhere around there. Maybe off a little motu near the pass, possibly within sight of the BBYC? My memory is fuzzy but I anchored there ( in '86) after first grabbing a mooring at the BBYC. Beautiful! Great job on the blog! !